Valspar’s Cabot Woodcare has developed Cabot Gold, a new satin finish stain that reportedly blurs the lines between indoor and outdoor living. Designed for exterior decks and patios and outdoor furniture, the product is said to mimic the appearance of interior hardwood floors through two coats. Cabot Gold comes in four different stain color options. “The first coat penetrates, while the second coat adds dimension as it seals, to protect against UV sun damage, extreme temperatures and rain and moisture,” according to the manufacturer. The company says all existing stain, paint and sealer must be removed and the surface cleaned and sanded to bare wood prior to application to ensure proper penetration and seal. The first coat should dry at least 24 hours before the second coat is applied, the company says. 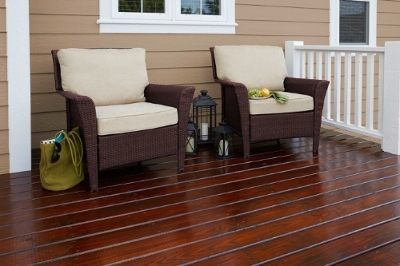 If applied to a deck, the surface should dry at least three days before returning furniture, the manufacturer adds. The product is available in four stain colors—Sun-Drenched Oak, Sunlit Walnut, Fireside Cherry and Moonlight Mahogany—and it can be used on both cedar and pine. Cabot Gold will be available on retail shelves in spring 2016 at a price of $45.98 per gallon.